Putting mats are fantastic tools that allow the user to put in almost lifelike conditions on a putting green. There are helpful alignment guides and the golf balls are returned once the ball has been put. Due to varying mat size, it is also very suitable to be used in the home or in the office for the smaller sized ones. Many people tend to overlook the significance of putting in enough practice time to improve their putting. That is why these tools allow for a high-quality putt return system that comes with a built in putter stand and back stop. The user is also allowed the convenience of tracking and diverting the return ball back to the player. Some high tech fiber mats will leave minor indentations following the path of your ball as it travels so that you can get a clear indication of how well you made the putt. It is also very hassle free to set up and the mat is made out of premium quality material that allows for immediate use out of the box. The Big Moss Augusta Putting Green is a premium putting and chipping green. Perfect for home and office use, it offers unmatched versatility for teaching and year-round practice. It rolls like a freshly-cut bent grass putting green with a True-Roll downgrain built right in. It is completely portable and sets up in minutes without tools. Break Snakes provide unlimited contours that you can create. The Club Champ Automatic Putting System with 7 foot putting green is designed with a regulation size cup and automatic ball return. The high quality turf simulates real grass just like on the course. It has a gravity flow return and is sure to sharpen your putting skills. This system is great for practice in your home or office. The high tech fiber mat will leave minor indentations following the path of your ball as it travels so that you can get a clear indication of how well you made the putt. It is also very hassle free to set up and the mat is made out of premium quality material that allows for immediate use out of the box. Putting green made from polyporpylene grass to simulate Bermuda grass to give you an authentic feel of speed, line and slope. Ball returns automatically from the back and side by gutters that track and direct the ball back to the putter after every shot. Completely portable, no batteries or electricity needed. At 7 1/2-feet long the Grassroots Deluxe Par 1 Putt-A-Bout Putting Mat is a high quality putting mat to help golfers practice their putting stroke. Regulation sized cup and 2 sand traps help catch missed putts. Many people tend to overlook the significance of putting in enough practice time to improve their putting. That is why this tool allows for a high-quality putt return system that comes with a built in putter stand and back stop. The user also allows for the convenience of tracking and diverting the return ball back to the player. This amt is a fantastic tool that allows the user to put in almost lifelike conditions on a putting green. There are helpful alignment guides and ball is returned once the ball has been put. Due to its size, it is also very suitable to be used in the home or in the office. With the SKLZ Vari-Break, you can practice reading and making putts with variation. The oversized true-roll putting surface can be manipulated with versatile, movable foam wedges for all kinds of practice. 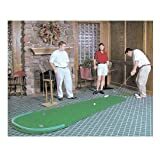 It includes two foam wedges and the Putt Pocket, which can be moved around the green for more putting scenarios and for fun putting competitions with friends and family. There are few things better than sinking that clutch putt, but in order to do that you need to practice, practice, practice. With the ProCircuit Putt Return System from ProActive Sports, just plug it in and go. Now, sinking putts becomes second nature. The track and diverter system, not only kicks your putt back to you, but puts it right back to your feet. Putt on the realistic mat, that feels like a green, and stimps to a nine (tournament conditions). The fully-adjustable system allows you to set up for right or left handed players and from three, six, or nine feet. This unit can be used inside the house, office, or garage. Just keep a putter or two on the putter stand/backstop and you're ready to sink that next putt in a moment's notice. Pro Circuit II Golf Putt Return System.The putt return that plays like a green.Putting surface stimps to a 9.Returns made and missed putts.Regulation size cup.120w. The SKLZ Vari-Break Putting Green gives you the ability to contour the green for almost any putt: uphill, downhill, left and right. Includes the SKLZ Putt Pocket to make the hole smaller and help the golfer focus on putting to the high side of the hole; also works as a movable hole around the mat. Lake & sand trap feature. Automatic ball return. Improve your putting with this great surface. Incline so green rises up towards the hole. Great fun and great practice. 6ft 5 inches Long. High Quality. Ideal for home or office use. Color is Green.